(Miracle) TREAT YOURSELF! 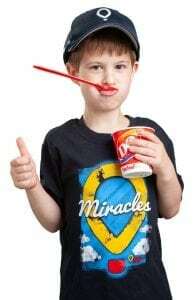 – Dairy Queen Corp.
THURSDAY is Miracle Treat Day! We at Children’s Miracle Network in Fargo have been training for this moment- tasting all sorts of delicious flavors like Reese’s Peanut Butter Cup or Summer Berry Cheesecake or Choco Brownie Extreme to report back to you and say… they are ALL delicious! For every Blizzard® purchased at participating locations in Eastern Montana, North Dakota and Northwestern Minnesota, Dairy Queen will donate $1 or more to Children’s Miracle Network at Sanford Children’s in Fargo.Your donation provides the best lifesaving technology, special programs unique to sick and injured children, education and research at Sanford Children’s Hospital. Admit it, you know you want ice cream anyway! (Miracle) TREAT YOURSELF! Previous post: Mark your calendars for Miracle Treat Day at Dairy Queen!